Friday's Fave Fave, What a Wonderful Week! I really don't know where my week has gone to! I have been very busy all week and there were loads of good things foe me to enjoy! Time to look back and share some of the highlights from this wonderful week! Time to join Friday's Fave Five hosted by Susanne at Living to Tell the Story. 1. Bought myself flowers on Friday. They were the finishing touch to my Easter and Spring decorations. 2. We have a nesting dove on our patio. She has two little ones. 3. At the lifestyle exposition we visited on Saturday I got a massage with the spa capsule. It's a machine which gives you a water massage without getting you wet. Relaxing music from the headphones and a fifteen minutes soothing massage ... Needless to say, I did not want to get out of that machine, it was sheer heaven! 4. We had a day out with the cooking school yesterday. 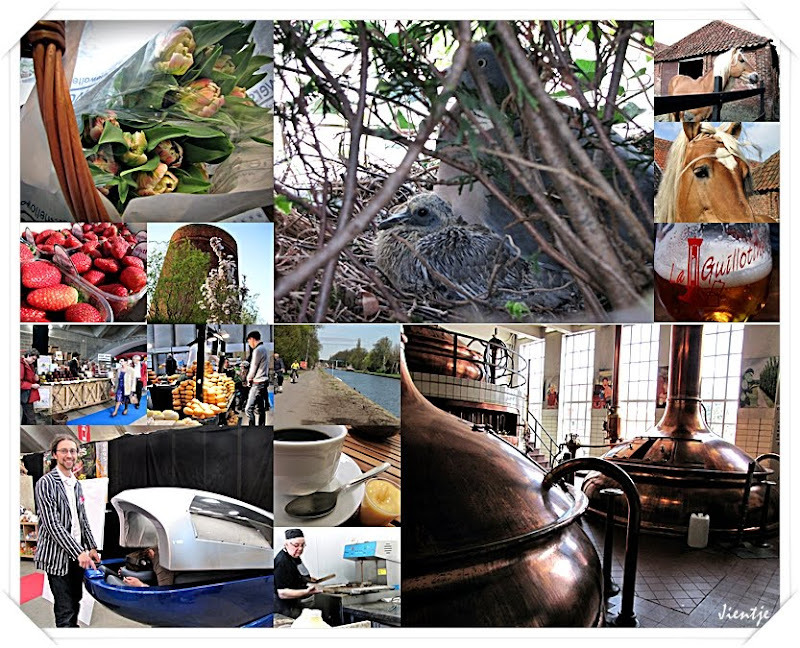 We visited a horses dairy farm, a brewery and a company which makes advocaat, refined jams, liqueurs, and chocolates. 5. The half liter of advocaat I brought home to gift to my husband, it tastes delicious! We've had some very beautiful days with warm temperatures these past few weeks. As a result of that the trees are blossoming much sooner than they normally would. I LOVE Spring, don't you? Kim, over at Frogpondsrock has created a new weekly meme called Sunday Selections. 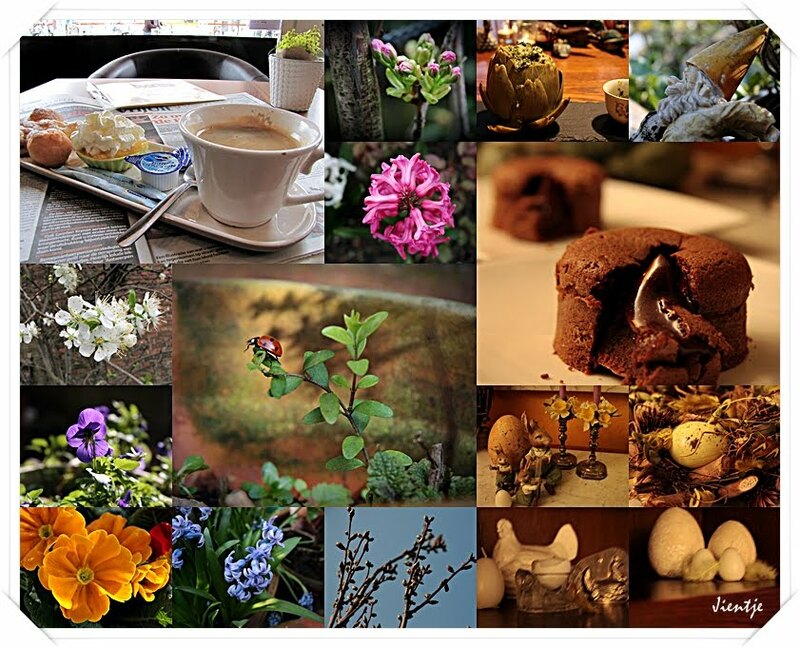 Publish your photos on your blog using the “Sunday Selections” title. I was browsing through my folders from March, one year ago and I found loads of unedited and thus unpublished pictures from a walk in Bruges I made then. I cannot believe I almost forgot all about them, it would be such a shame not to publish them! I hope you enjoy this walk around my city of birth! Another week has passed and it is now time to look back and share some of it's highlights. Time for another Fave Five, hosted by Susanne at Living To Tell the Story. It's been a very nice week. The weather has been warm and summery at the beginning of the week, with only a little bit of rain and cold spells yesterday.Well, it's only April first today I can truly say we have been spoiled by the month of March! 1. The nice weather made me spend more time outside. I even did my ironing outside on the patio. I love to iron and listen to the birds chirping, I think it's very relaxing! 2. Spring cleaning, cleaning out closets and decluttering, Spring seems to do that to you and I love it! 3. I put up my easter decoration and it looks lovely. I've decorated with eggs, a collection of chickens, easter bunnies, flowers in bright colors ... it looks lovely and fresh! 4. bicycle tour with my friend. We made a big tour on Tuesday and sat down to enjoy a glass of wine afterwards. 5. Artichokes. I ate my first artichoke of the season and loved it!